On Valentine's Day, BitDefender released a short writeup title, "New Xagent Mac Malware Linked with the APT28". In the writeup, they discussed a new piece of Mac malware, (XagentOSX/Komplex.B) associated with APT28 (aka the 'Russians'). They did not provide much technical detail, but did state, "this modular backdoor with advanced cyber-espionage capabilities is most likely planted on the system via the Komplex downloader." It's a basic 'first-stage' implant, that as the BitDefender report notes, may (most often) be used to download more complex 'second-stage' implant (i.e XagentOSX/Komplex.B) on targets of interest. Regardless, a claim of a new "advanced cyber-espionage" piece of Mac malware? Count me in - sounds exciting! Although the BitDefender report didn't provide any hashes of the malware, digging around, I found the sample I believed matched. With a SHA256 hash of 2a854997a44f4ba7e307d408ea2d9c1d84dde035c5dab830689aa45c5b5746ea, this sample was submitted to VirusTotal on February 8th. At that time, it was only detected by Kaspersky (as the wise @noar pointed out, likely their heuristic signatures flagged it - nice!). 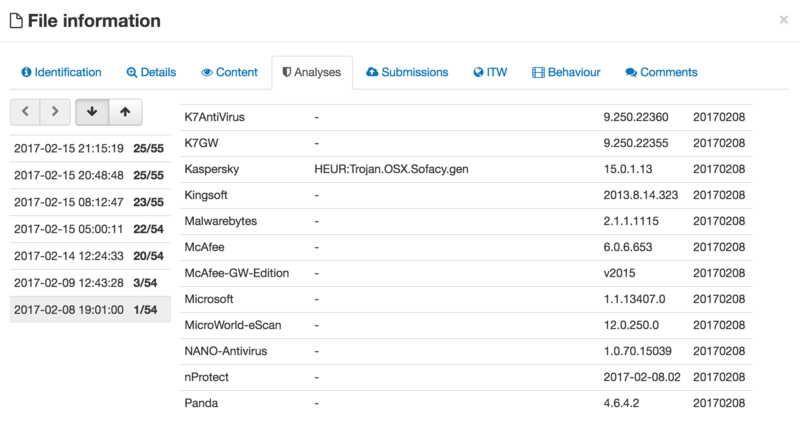 As of today, looking the VirusTotal report, we can see it's now flagged by 25 anti-virus companies. 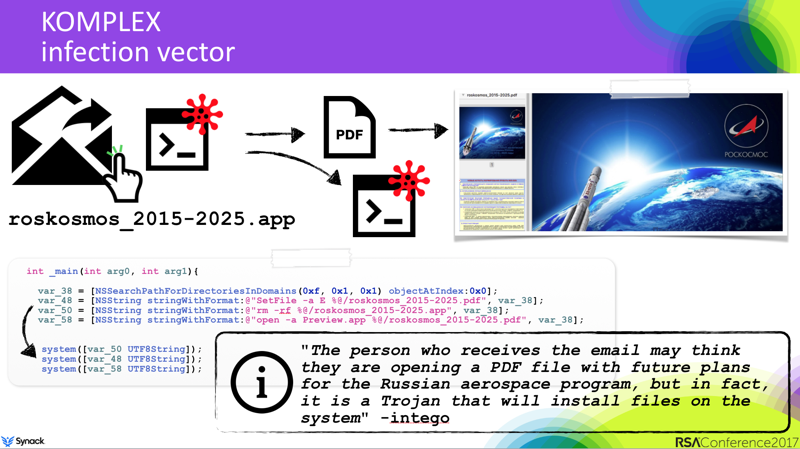 Later in the day, PaloAlto Networks Unit42 (perhaps the original group that discovered the malware) posted a more technically comprehensive analysis of the malware titled, "XAgentOSX: Sofacy's XAgent macOS Tool". Their research contains a hash (matching the sample I posted) and delves into the malware's command and control (C2) communications, commands, and infrastructure. It's a great read. Now, code injection is an excellent feature to add to one's malware creation (think stealth, security tool bypasses, etc etc). However, as an 'advanced feature', it's very rare in (known) Mac malware. As such, it was something I wanted to take a closer look at. As there are a variety of ways to perform code injection on OS X/macOS, my main goal was to see how XAgentOSX/Komplex.B implemented it. 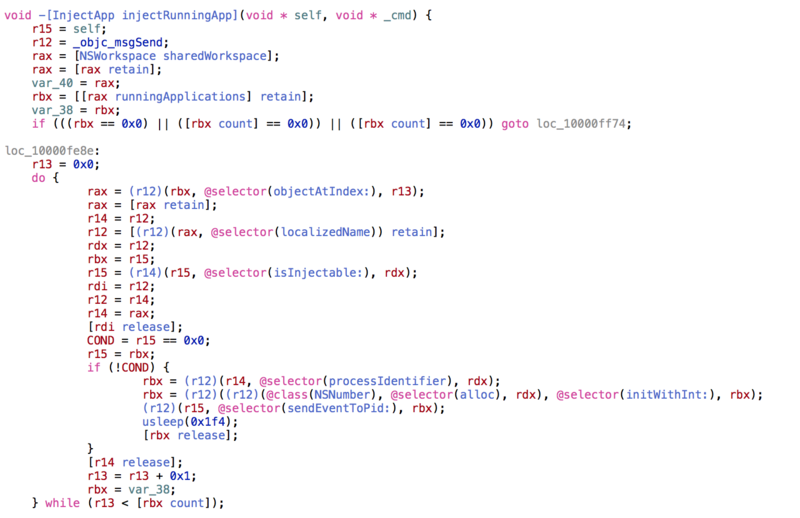 In other words, it appears that this injection code, though present, is not utilized by the malware. Still, I wanted to dig into its internals. When analyzing a piece of malware, I find that static and dynamic analysis, performed in parallel, are the best way to fully understand a piece of malware. Unfortunately since the malware doesn't actually invoke the injection code (i.e. nobody invokes -[BootXLoader injectApplication] method), we can't just set a debugger breakpoint and wait until it's hit. No worries! Using the debugger we can coerce the malware to call it :) Specifically we can simply change the instruction pointer, RIP, to point to the start of the -[BootXLoader injectApplication] method. Current executable set to 'Xagent' (x86_64). 0x100014d9d: 48 8b 35 2c f5 01 00 movq 0x1f52c(%rip), %rsi ; "alloc"
0x100014dae: 48 8b 35 23 f5 01 00 movq 0x1f523(%rip), %rsi ; "init"
Setting a breakpoint on the InjectApp's injectRunningApp method, we can hit continue ('c') in the debugger and it will break at there. Neat! dq offset cfstr_Mdworker ; "mdworker"
dq offset cfstr_Systemuiserver ; "SystemUIServer"
dq offset cfstr_Dock ; "Dock"
dq offset cfstr_Launchd ; "launchd"
dq offset cfstr_Loginwindow ; "loginwindow"
dq offset cfstr_Usereventagent ; "UserEventAgent"
If the application name that was passed to the isInjectable: method matches any of the system, 'blacklisted' applications, the method will return 'NO' (0x0, false) to indicate that the application should not be injected into. From the above decompilation, we can see that the code retrieves the process identifier (PID) of the 'injectable' application and passes it to the sendEventToPid: method. The sendEventToPid: method is where things get interesting. Or so I thought! 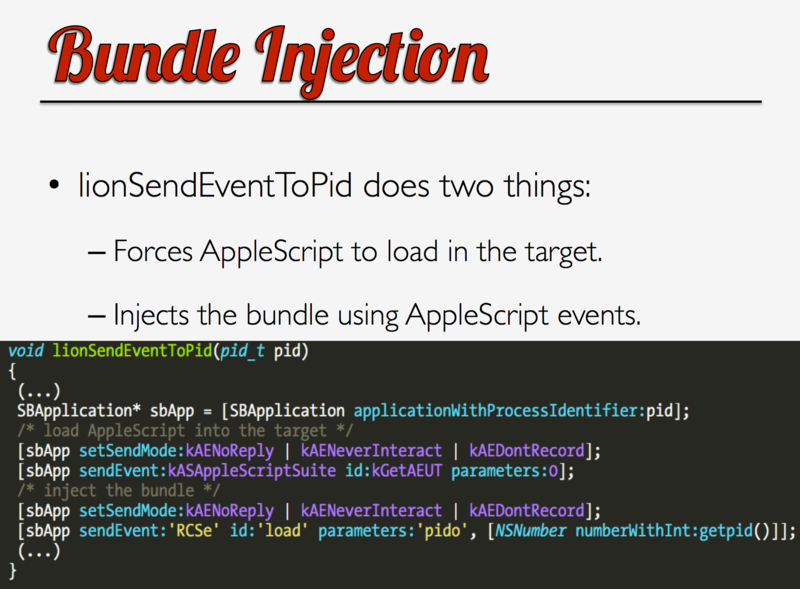 Ok, so the malware is using AppleScript to inject code into a remote process. But wait a minute, we've seen this before? Where?? HackingTeam! In 2015, I wrote a blog titled "Building HackingTeam's OS X Implant For Fun & Profit". In that blog I detailed how to build Hackteam's RCS mac implant (while was leaked as part of a massive hack). An interesting feature of their code was their application injection logic which used AppleScript. Since @osxreverser previously covered this injection technique and source code (now) exists for it (see RCSMCore.m), we'll end our binary analysis of the injection technique here. However, we're faced with an interesting question. Does the XagentOSX/Komplex.B malware simply make use of the same injection technique? or does it use the exact same code? As we'll show, I'm 100% confident it's the latter. So why do I think XagentOSX/Komplex.B used the HackingTeam code versus simple re-used the same technique? Well first it's alway easier (lazier?) to cut and paste from existing code than re-implement from scratch. And since the Russia supposedly bought stuff from HackingTeam or had access (like everybody else) to the leaked source code online - this seems the logical route. We can make a much more compelling argument, that to me, proves without a doubt that it's the same code, by comparing the compiled code in the XagentOSX/Komplex.B with the leaked HackingTeam source code. Finally we can also see that 'mistakes' in HackingTeam's code made it directly into XagentOSX/Komplex.B. This, IMHO, is a very strong indicator that HackingTeam's injection code was directly used (versus the malware author's reimplementing the logic). This code, from the isInjectable method, is broken! How? Well if appName is nil, then and only then, will the second part of the if statement (! [appName isKindOfClass: [NSString class]]) be executed. However, if appName is nil, executing that code makes no sense. Sending the isKindOfClass message to a nil object, will always just return nil. ;this will only be executed if r12 is nil, wtf!? It's actually 'easier' to see this bug in the malware's decompiled code (vs. the HackingTeam source code). The register, $r12 contains the parameter, appName. First it's checked to make sure it's not 0x0 (nil). If it's not nil, the code jumps logic that continues. Otherwise, if the parameter appName is nil, the code will execute the second half of the if statement (! [appName isKindOfClass: [NSString class]])). Again, I don't see any reason why one would call isKindOfClass on a nil object. At this point it should be pretty clear that the injection code in the XAgent/Komplex.B malware is HackingTeam's original code, most likely copied and pasted. However, if we continue our analysis, we can see that certain parts of HackingTeam's code (i.e. 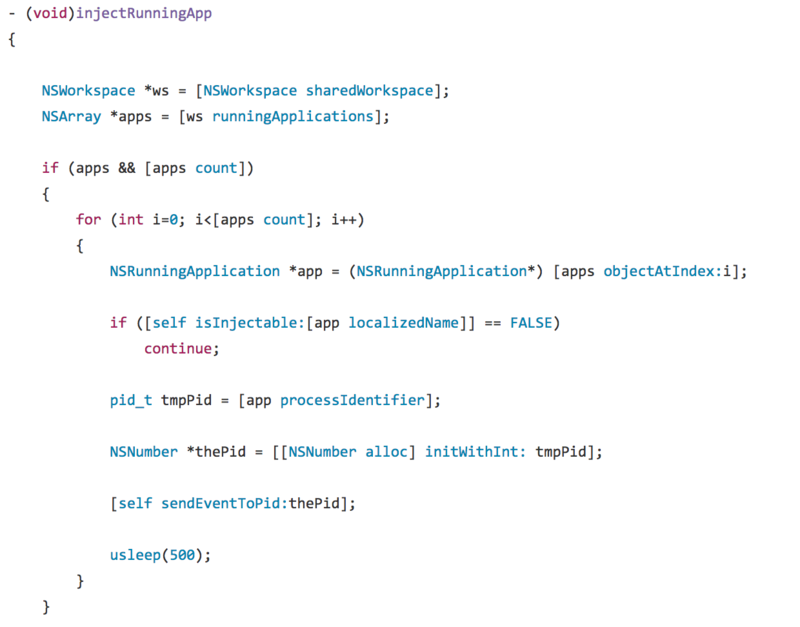 code not related to the app injection) didn't make it into the malware's binary. In other words, it was a selected copy and paste. How can we tell? Let's take a closer look. A lock of a global variable (gControlFlagLock), immediately followed by an unlock seems pointless. Normally one locks a variable, then executes some critical section of code, then unlocks the variable. Morever the _gControlFlagLock variable only is referenced in the lock/unlock calls and nowhere else in the malware's binary. This means it is never initialized, and thus will be be nil. "STOP" will never equal "START" so again this check pointless, leaving one wondering why it's even in the binary. The taskManager variable is of type __m_MTaskManager. This appears to be a class that, as its name implies, deals with delegating tasks and/or otherwise controlling various components of the entire HackingTeam implant. Obviously if one is looking just to rip out (off?) the injection part of the code, the 'Task Manager' code/logic isn't needed and thus would be removed. The removal of 'Task Manager' code/logic explains both why the code in the compiled XAgent/Komplex.B malware had a call to [gControlFlagLock lock] immediately followed by a call to [gControlFlagLock unlock], as well as comparison between two hard-code strings (that would never match). Sometimes reversing sessions take interesting twists and turns. Here, I started by looking that the 'app injection' logic in XAgent/Komplex.B with the goal of uncovering the injection mechanism. 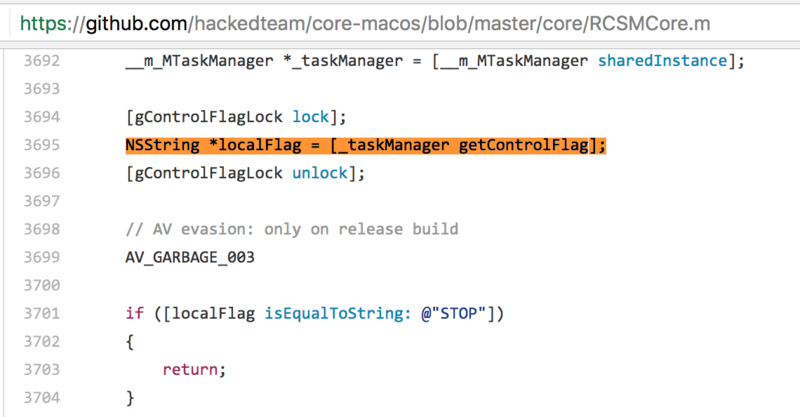 However, during this investigation, we discovered that the malware was clearly utilizing code from HackingTeam's leaked Mac implant. By comparing various pieces of HackingTeam's source code with code compiled into the binary, hopefully it's quite obvious that the XAgent/Komplex.B authors used the HackingTeam's code directly - versus reimplementing it themselves. If I had to guess, I'd say that even though Russia supposedly bought stuff from HackingTeam (which could have included source code? ), the malware authors likely just copied and pasted from the HackingTeam leaked source code. Though we'll likely never know all the answers, its surprising how much one can ascertain by simple reversing a binary!